Pagan Snakes! 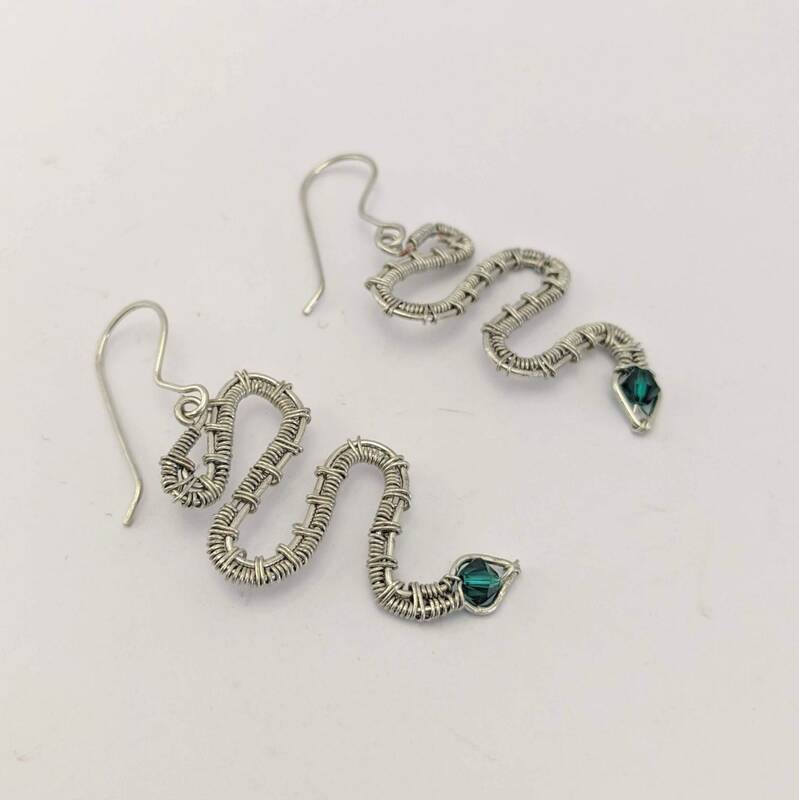 Embrace the snake myth and wear these unique handmade snake earrings. It has a 4mm Swarovski crystal head and a 3mm (1/8") wide wire woven body. It measures approx. 3/4" wide and 38mm (1 1/2") from the tip of his nose to the loop on his tail. Overall length is approx. 2 1/4" including the handmade ear wire. This one is the perfect way to say "Happy St. Patrick's Day!" OR....to wish "Happy Birthday" to a Taurus (May) or pagan friend! St. Patrick's Day Myth - Why Doesn't Ireland Have Snakes? Legend has it that, back in the fifth century A.D., St. Patrick exterminated Ireland's snakes by driving them into the sea. He would appear to have done a thorough job, because Ireland is free of native snakes to this day. Except, Ireland never actually had snakes. The myth is allegorical since the serpent is associated with Satan in the bible. St. Patrick actually drove pagans out of Ireland. And, by the way, his real name was Maewyn Succat and he was buried in Down Patrick, thus how his saint's name came to be. 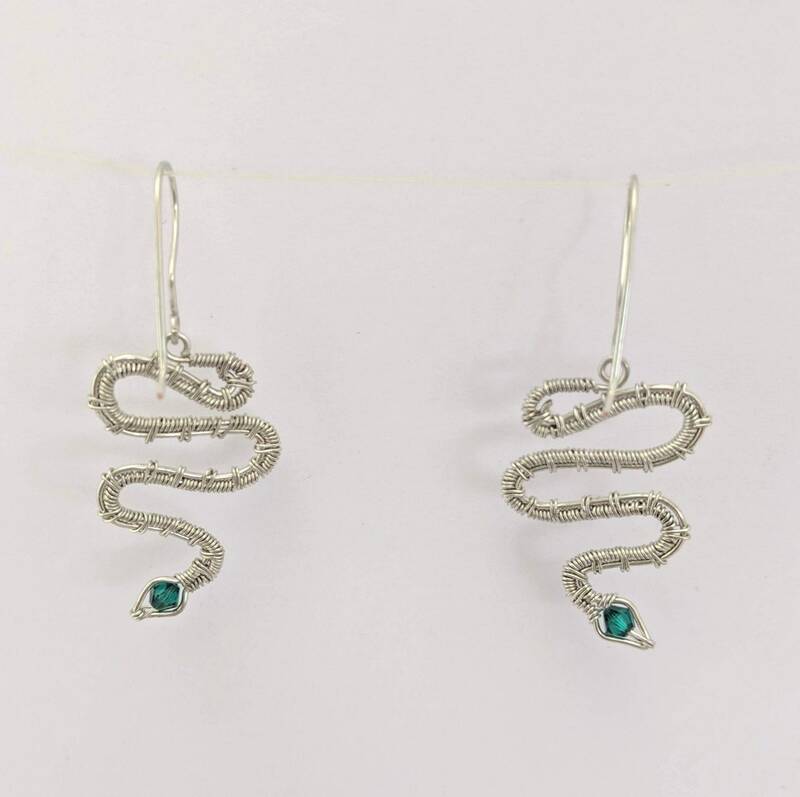 SNAKE SYMBOLISM - Fertility and rebirth. 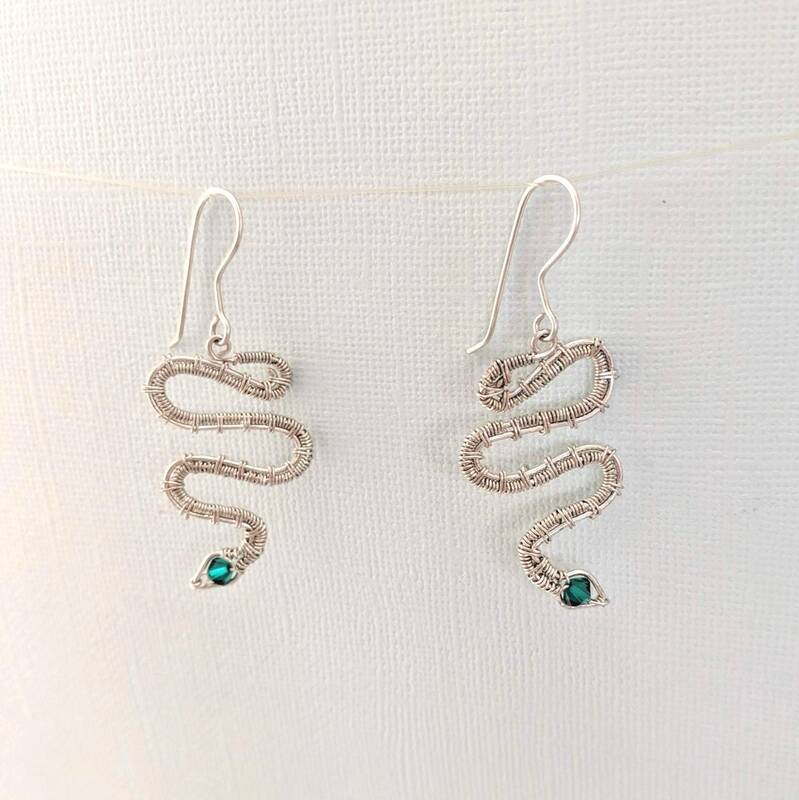 Historically, serpents and snakes represent fertility or a creative life force. 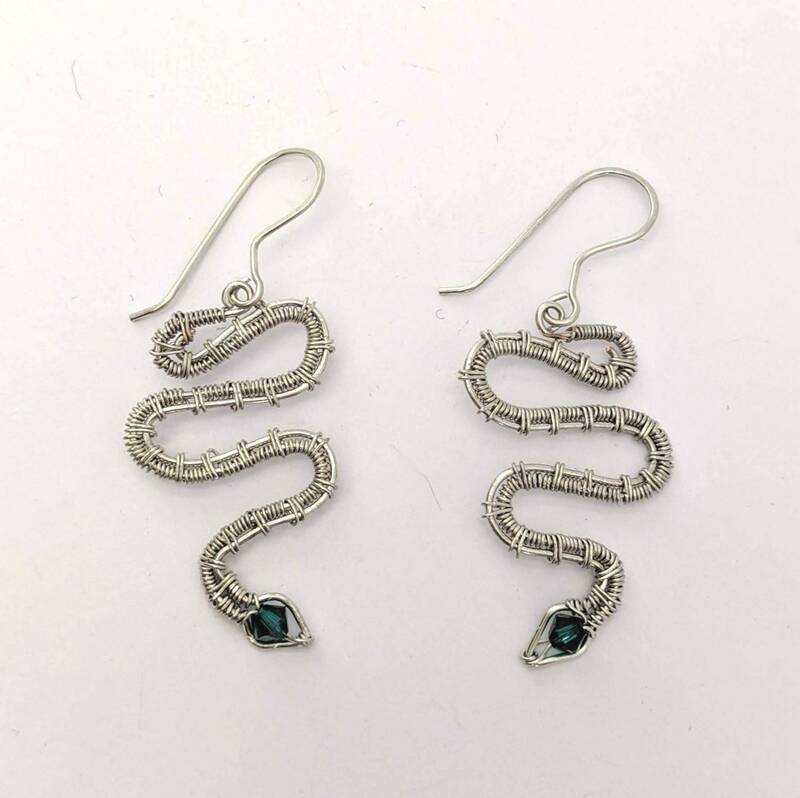 As snakes shed their skin through sloughing, they are symbols of rebirth, transformation, immortality, and healing. The Ouroboros where the snake is swallowing its tail, is a symbol of eternity and continual renewal of life. CHINESE ZODIAC SNAKE - In the Chinese zodiac, the Snake has its own world, its own unique perspective. 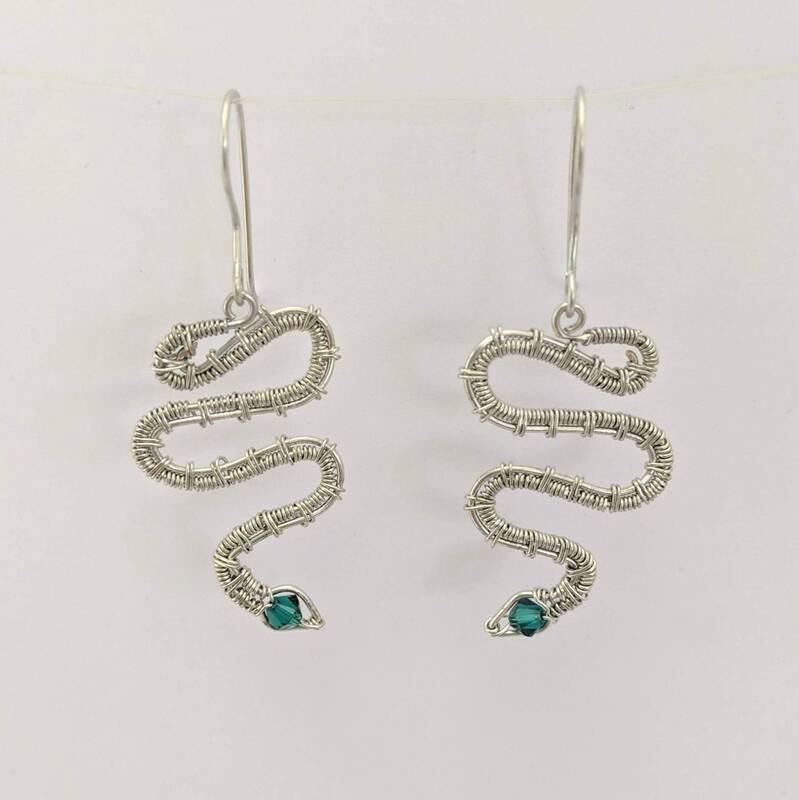 This means Snake energy won’t always have the emotional insight to see things the way other signs do. It’s not like this sign lacks compassion – they just express empathy differently than others. Custom Order for someone's birthday - A birthday chart is included with this listing to view other months and their crystals.